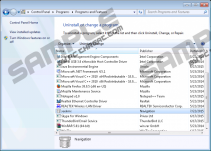 Seekmx.com is a new search tool that has been classified as a browser hijacker. Once it gets installed on your computer, it modifies the home pages without your permission in all major browsers, including Mozilla Firefox, Internet Explorer, and Google Chrome. This is a breach of your privacy and should not be tolerated if you take your virtual security seriously. The presence of a browser hijacker on your system is never good news. Apart from the potential risks Seekmx.com might hold, it is quite possible that there are other malware infections on your computer that require your attention. Not acting now might result in even more infections, more security and privacy issues. It is essential to understand the possible risks with regard to the health of your operating system or the safety of your personal and banking details. From our article you will get a better picture why it is important to remove Seekmx.com from your computer and how you can do that. Seekmx.com browser hijacker mostly targets computer users residing in Brazil, Spain, and Mexico. But let us not forget that the Internet does not really have boundaries. Thus, it is possible that wherever you are physically on the planet, you might get infected with this hijacker. Since Seekmx.com mostly travels in free software packages, so virtually, anyone can download it from questionable freeware hosting websites, for example. All you need to do is click on an advertisement or a fake button and you might find yourself installing a bundle filled with infections. However, you need to know that usually you do have an opportunity to opt out. If you read the EULA or the pages of the installation wizard carefully or you choose the Custom option, you can either un-tick the designated checkboxes or cancel the whole installation altogether. Unfortunately, these steps are overlooked by users most of the time, and that is how they let malware on-board unknowingly. In order to be on the safe side, we recommend deleting Seekmx.com as soon as possible. Seekmx.com is identical to another well-known browser hijacker, searchult.com. As we have already mentioned, once this hijacker gets installed, it modifies the home pages in your browsers and sets them to point to seekmx.com. This search tool does not have anything to offer you apart from a redirection to Google search result pages when you enter your query in its search box. We recommend using your preferred search engine or any of the major, reliable ones, such as Google, Yahoo!, and Bing. Although this hijacker did not display third-party ads and sponsored links on modified search result pages while it was tested in our internal lab, keep in mind that its creators need to make money somehow out of it and Seekmx.com does have the potential to work like any other browser hijacker. This means that, with time, it can start showing potentially unreliable ads and links, which might put your system at risk if you clicked on them. Therefore, we suggest that you remove Seekmx.com before you become exposed to unreliable content. The only useful component of Seekmx.com is definitely its uninstaller since it makes it so easy to remove it from your system. 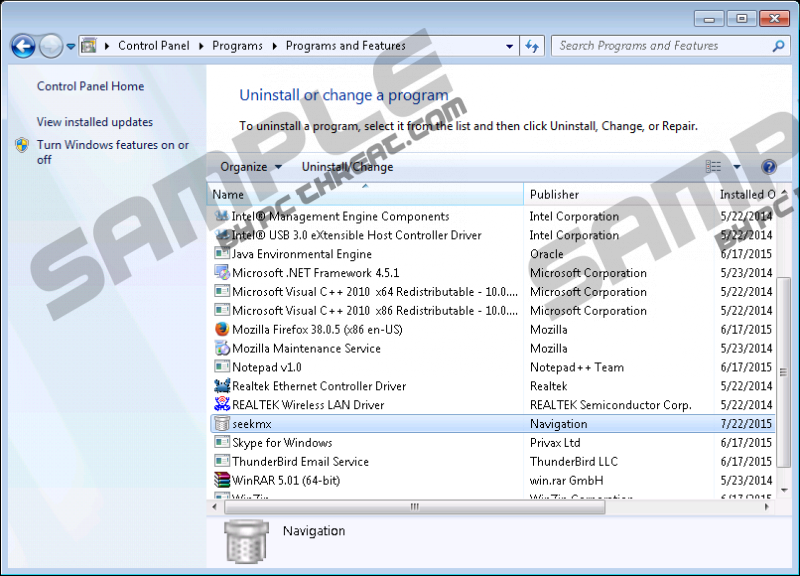 Find seekmx in the list of installed programs in Control Panel and simply uninstall it. If you follow our instructions below, you will be done within a minute. However, if you are not comfortable with this, you should go for the automated solution, which can solve all your problems with regard to the security of your computer. We recommend installing SpyHunter, which is a reliable antimalware program that can detect and eliminate all known infections and protect your PC from any future infiltration. Tap Windows+R and enter Control Panel. Press OK.
Quick & tested solution for Seekmx.com removal.